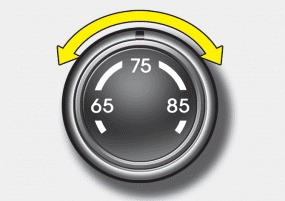 The temperature will increase to the maximum by turning the knob to the right. The temperature will decrease to the minimum by turning the knob to the left. 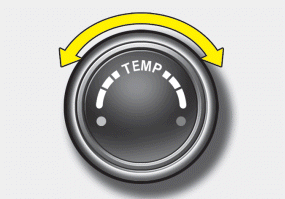 When turning the knob, the temperature will increase or decrease by 2°F for type A or 1°F for type B. 1. Press the DUAL button to operate the driver and passenger side temperature individually. Turning the right temperature control knob will automatically switch to the DUAL mode as well. 2. Turn the left temperature control knob to adjust the driver side temperature. Turn the right temperature control knob to adjust the passenger side temperature. 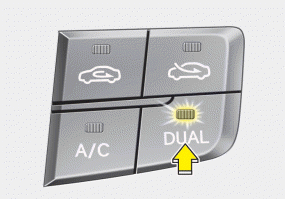 When the driver side temperature is set to the highest or lowest temperature setting, the DUAL mode is deactivated for maximum heating or cooling. 1. 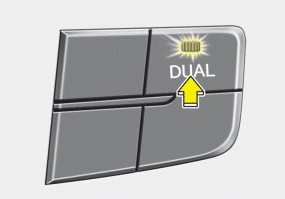 Press the DUAL button again to deactivate DUAL mode. The passenger side temperature will be set to the same temperature as the driver side temperature. 2. Turn the left temperature control knob. The driver and passenger side temperature will be adjusted equally.